Welcome to the SFX Sound Sampler / SFX Recorder home. 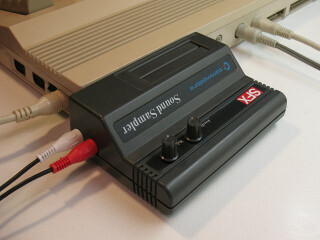 The SFX Sound Sampler is a pretty rare C64 cartridge originally meant to be used as some kind of primitive effect machine for musicians. It came with a microphone and some software, which allowed to record small pieces of sound (up to 1.4 seconds) and replay it on demand. The core of the cartridge is an 8 bit ADC (ZN 449E) and an 8 bit DAC (ZN 429E). Both are accessed via the C64's IO1/IO2 areas. To sample the current audio level, you first have to start the sampling by writing anything to IO1 ($DE00), then wait about 20 clock cycles or more. After that you can read the sample on IO2 ($DF00). Using the DAC to output a sample level is easier, simply write the value to IO2 ($DF00). There also is a simple volume control and a feedback potentiometer. Since the original software is quite useless for real sampling, I have written an own small sampling tool. It allows clock cycle accurate sampling and offers sample rates from 20107 Hz to 547 Hz. The sampling buffer is only 48 KiB, so usually only a few seconds of sampling is possible. Last change on 9/10/2012. For comments contact Graham.